Peterhead's Jordon Brown evades a tackle from Declan Hughes. 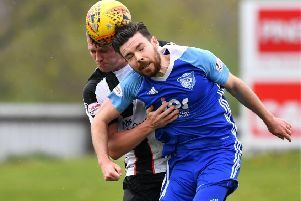 Peterhead had been heading for all three points at Central Park Saturday when they were stunned by a last-gasp equaliser from ten-man Cowdenbeath. Blue Toon striker Rory McAllister had opened the scoring after just two minutes. Rory McAllister celebrates his penalty opener. Shane Sutherland had been taken down by Mo Yaqub and the referee pointed to the penalty spot. McAllister made no mistake in scoring to give Peterhead the early advantage. However, Cowdenbeath were level by the quarter-hour mark, with Gordon Smith scoring his first goal for the club. The scoreline remained even until the break before Shane Sutherland launched a brilliant left-foot effort into the back of the net to make it 2-1 to the visitors. Scott Ross has an attempt saved by keeper Jamie Sneddon. Mo Yaqub was sent off for a second bookable offence leaving Cowdenbeath with just ten men and their hopes of taking anything from the game fading. The home side gritted their teeth and caught the Blue Toon defence napping when, just eight minutes from time, Greig Spence latched on to a long ball before squeezing his finish past Peterhead goalie Graeme Smith to give Cowdenbeath the equaliser. Prior to Saturday’s game, Blue Toon boss Jim McInally said he was ready to make the changes needed to start winning games. “A few of the players have been in the squad based on past performances,” he said. McInally believes the competition of starting berths is now fiercer than at any point during his time in the north-east. “The boys are playing for their places now,” he added. Meanwhile, Peterhead’s Shane Sutherland said he was delighted to grab his first goal for the Toon on Saturday. “I had hoped that it would be the winning goal but we really needed a third goal to put the game beyond Cowdenbeath and we just weren’t ruthless enough,” he said. “I think we thought it would be easy when they went down to ten men and we probably took our foot off the gas a bit. “However, I think we played well and I think we’ll do okay this season if we keep on playing the way we are. “I think we’ll be disappointed if we don’t make the play-off spots in May,” he added.